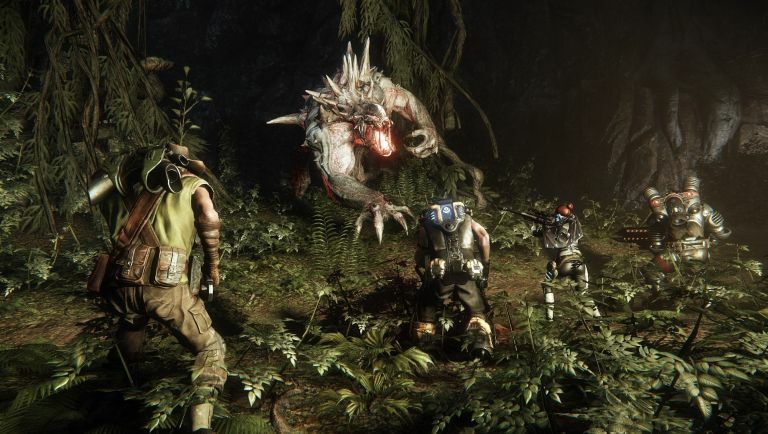 Evolve, the four-versus-one shooter from developer Turtle Rock, is going free-to-play on PC as the studio attempts to turn the fortunes of its much-maligned new IP. The comes following a difficult first 17 months for the asymmetrical FPS as a raft of mixed reviews and an overwhelmingly negative reaction to its convoluted downloadable content plan that saw packs and content drops released in increasingly bizarre pricing schemes. Players who have already bought the game will be given 'founder status' and have all their unlocks transferred over to the new version of the game, while every single element to the game (including weapons, skins and all DLC packs) will be unlockable via in-game currency. In other words, you could potentially unlock everything without spending a penny or a cent. There are also a raft of new gameplay changes, but the same core monster v hunters setup will remain only now with a few extra twists to entice new players and lure back those that paid for the original version. "...when Evolve launched, the reception wasn't what we expected," commented co-founders Chris Ashton & Phil Robb. "Sure, there were some good reviews. There were also bad reviews. Yes, there was excitement. There was also disappointment – for players and for us. The DLC sh*tstorm hit full force and washed away people's enthusiasm, dragging us further and further from that first magical pick-up-and-play experience." "We want that magic back and we aim to make it happen," they added. "We've made a lot of changes, improvements and additions to Evolve over the past year and we've got a lot more coming. In short, we're giving this game a vigorous overhaul!" The changes will be rolled out in a beta on PC first, with plans to introduce a free-to-play model to the console versions on PS4 and Xbox One as well shortly after. Why not check out: T3's favourite console launch games - ever!